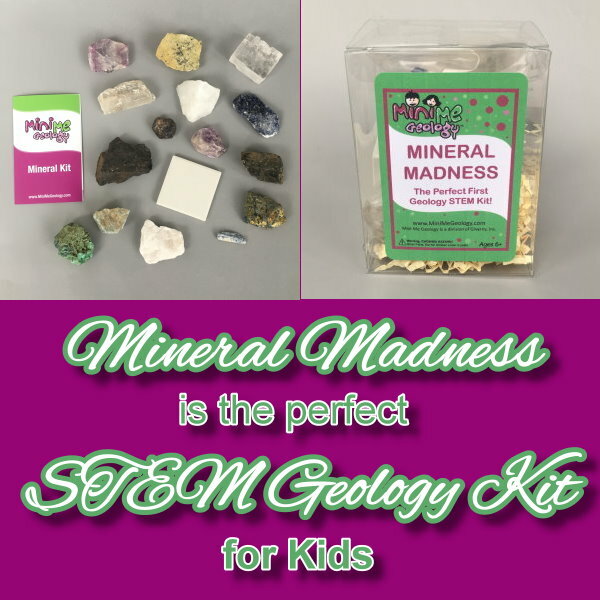 Mini Me Geology is proud to announce their newest geology kit, Mineral Madness. With the importance of STEM education rising, we are dedicated to developing kits that allow children to explore science with quality hands-on samples, accessories and information. The Mineral Madness kit has fifteen (15) mineral samples, a white streak plate, and a mineral identification brochure. Kids are challenged to identify each sample using the streak plate, visual observations and the information in the brochure along with support information from the Mini Me Geology website. After kids determine the name of the sample, the brochure provides additional information about the properties, use, and common locations for each mineral type. A 2” x 2” white streak plate is included so that students can test the color of the streak to help in the mineral identification process. The brochure includes information such as color, luster, hardness, streak, and features, which will help in the identification process as well as a picture of a typical sample. Mini Me Geology offers free resources in our Dig Into Geology section of the website including how to videos and printable identification flow charts to assist you they work to identify your new samples. Follow these links to download your own free identification charts and learn how to properly test your mineral samples. Join in our Mineral Madness and get your kit today! If you have questions about the kit or any of the samples, get in touch. We have a new free 53-page Rock and Mineral Fun Book available for kids, classrooms and home school families and groups. Sign up for our newsletter through the blog (top right corner) or on our website. You will get an email with a link to download the book. Please note that our newsletter is a double opt-in so once you complete the second opt-in you will immediately receive the email with the download link. The Rock and Mineral Fun Book includes puzzles and coloring pages, experiments, rock and mineral identification flow charts and image galleries, birthstone details and a copy of Viktor’s Ice, the first book in the Crystal Cave Adventures rock collecting, time travel series for kids.